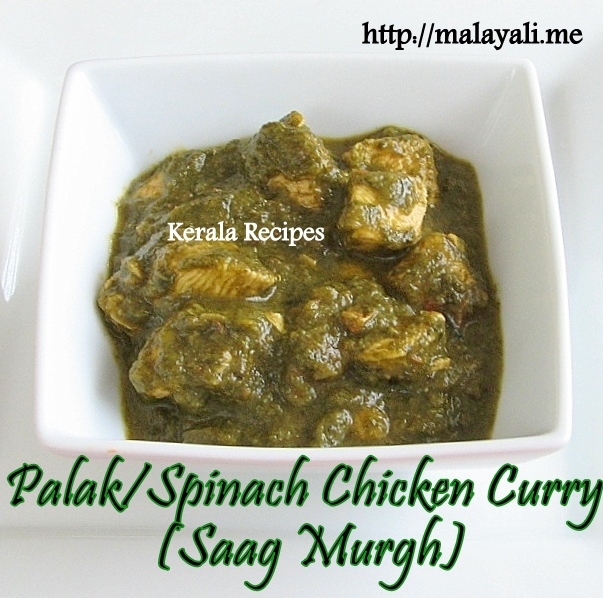 Here is another classic North Indian Curry – Palak/Spinach Chicken Curry also known as Saagwala Murgh. ‘Saag’ stands for ‘Greens’ in Hindi. You can use any greens for this recipe but spinach is commonly used. This is a nice way to include healthy greens in your non-vegetarian curry. This recipe was adapted from Madhur Jaffrey’s book “From Curries to Kebabas”. This chicken curry tastes very different from the usual Kerala Chicken Curries and is less spicy. If you are used to eating South Indian Chicken Curries, then you may take a while to get accustomed to the taste of Spinach & Chicken. This recipe doesn’t use Turmeric Powder & Garam Masala Powder unlike the usual chicken curries. Nevertheless, I added chicken masala powder as I felt the curry was a bit bland. If using frozen spinach, defrost it in the microwave before boiling it. Boil the fresh or frozen spinach with 1/2 cup of water for around 5 minutes until the leaves are tender. Wash and drain and chop the spinach very finely or blend it. Set aside. Blend the onions, ginger and garlic with little water to get a smooth paste. Keep it aside. Heat oil in a large nonstick pan and throw in the cardamom and cinnamon. Add the onion paste and stir fry for 5 minutes until the paste is lightly browned. Add the chopped tomatoes and cook until mashed and pulpy. Reduce heat and add coriander, cumin, chicken masala and red chilly powders. Stir fry for a minute. Add the chicken pieces and saute for a minute or two. Add 1 tbsp of yogurt at a time and keep browning the chicken for 5-7 minutes. Add the finely chopped/pureed spinach and stir fry for a minute. Add 1 cup of water and salt to taste. Mix everything and simmer gently for half an hour until the chicken is cooked.